All-in-one toolkit to merge and consolidate data in Excel. 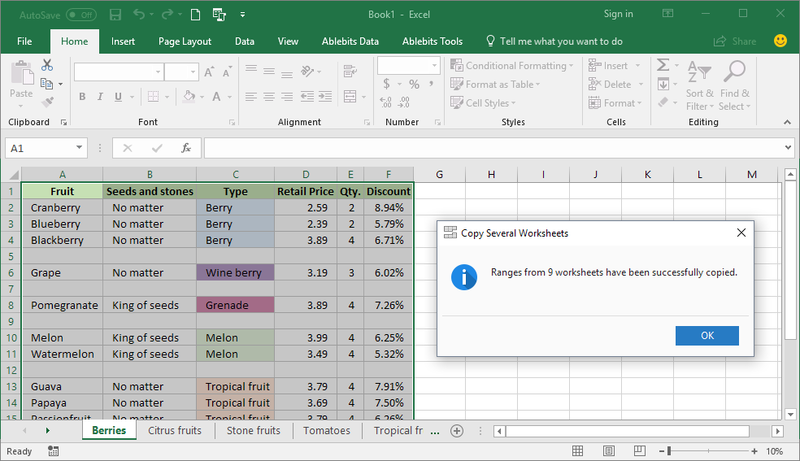 Use the Copy Sheets add-in to bring worksheets from different workbooks together or combine data from multiple sheets into one. Get the Consolidate Sheets wizard to summarize data for your reports. 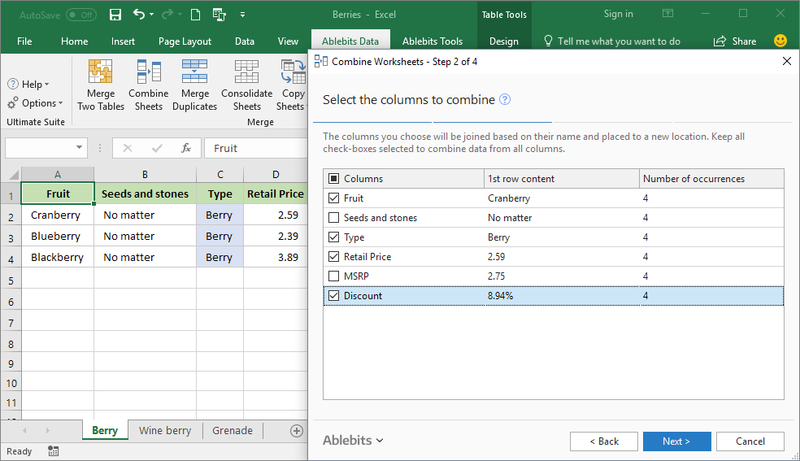 Utilize the Combine Sheets tool to merge Excel sheets based on column headers. 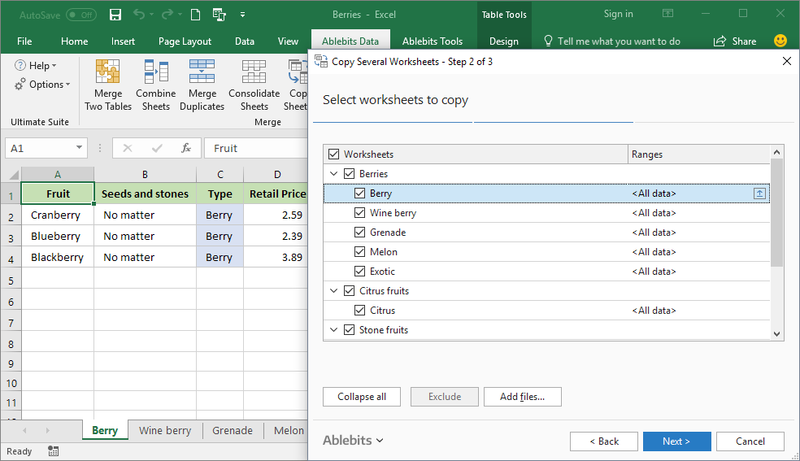 Combine multiple Excel files into one Merge numerous workbooks and worksheets into one file without even opening each of them. Merge selected sheets into one workbook Select the worksheets of interest from various files and have them copied to a single workbook. 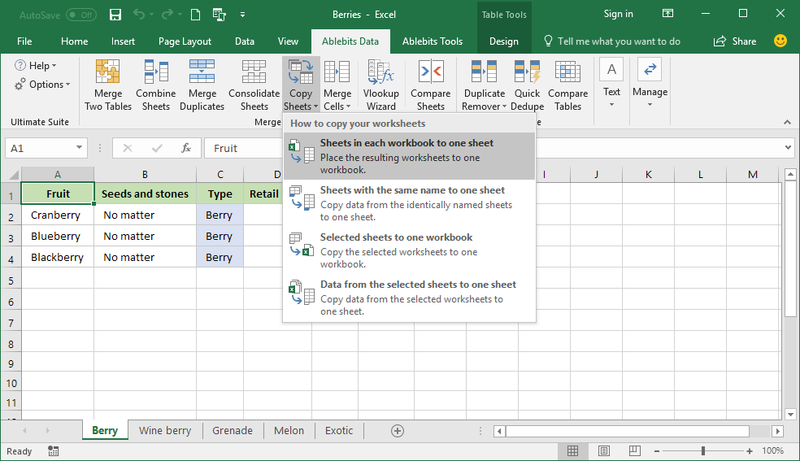 Collect data from identically named sheets Merge data from all the worksheets with the same name into one spreadsheet. Copy data from selected sheets Select ranges of data to pull them from many Excel worksheets into one. Merge tables based on common columns Bring data from identically named columns of different tables together. Consolidate data in Excel Get a full summary report by merging and summarizing data from multiple Excel files. Save formatting of each table If needed, keep the formatting of all original tables that have been brought together. Choose a place for results Put the results to a new worksheet, workbook, or any specific location in any worksheet. Copy sheets in each workbook to one worksheet and place the resulting sheets in one file. Copy data from the selected sheets with the same name to one sheet. Copy data from the selected worksheets to one sheet. Consolidate data by row and column labels. Combine worksheets by column headers. What is Combine Worksheets Toolkit and what do I need it for? 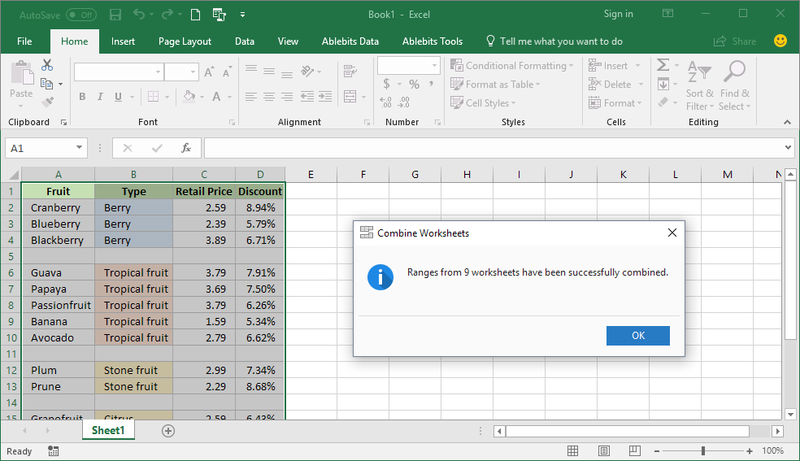 The Combine Worksheets Toolkit lets you merge multiple Excel files into one without copying and pasting. It offers 3 tools to do that. Copy Sheets copies worksheets or data from several workbooks into one. You can choose to arrange the copied datasets side by side or one under another, save the original headers, formulas, and even formatting. Combine Sheets merges spreadsheets based on their column headers. You decide whether to bring the data together from all or specific columns. Consolidate Sheets comes in handy when you need to merge and calculate numbers at the same time. The wizard consolidates numeric data using Excel summary functions (aggregation functions) such as SUM, COUNT, AVERAGE, MAX, MIN, etc. Doesn't Excel provide a free way to combine many Excel files? You can merge sheets in Excel using VBA. But this approach requires some skills and has a number of limitations. 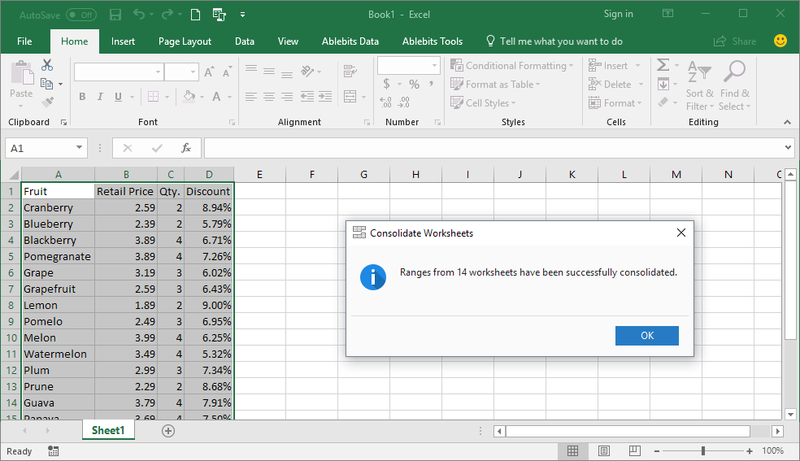 Or, you can try combining data from multiple worksheets with Power Query. However, this way is rather difficult and requires a long learning curve. 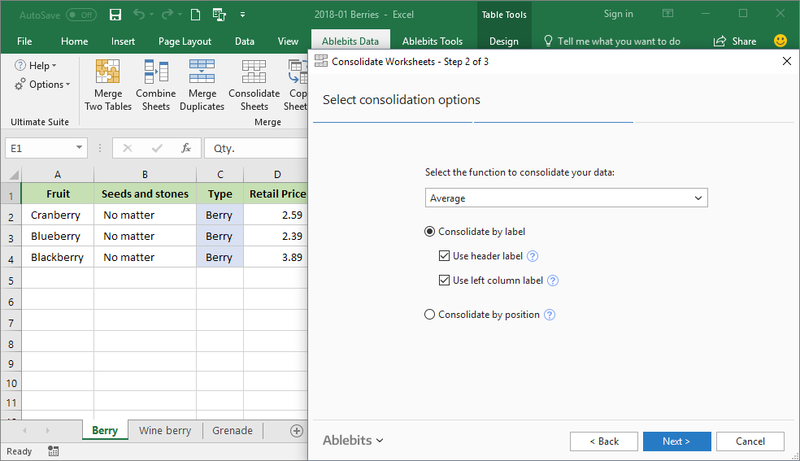 Finally, you can use Excel's built-in Consolidate tool. Compared to the first two methods, it's quite easy to use, but it works only for summarizing numeric data. Our toolkit offers many different ways to merge Excel files of any structure and size. How to merge multiple Excel files into one? Click Copy Sheets on the Ablebits Data tab. Sheets from each workbook to one sheet. Sheets with the same name to one sheet. Selected sheets to one workbook. Data from the selected sheets to one sheet. Select the worksheets and, optionally, ranges to copy. How to combine Excel sheets based on column headers? Choose the columns to combine. Select additional options if needed. Specify where you want to place the result. How to consolidate data in Excel? Click Consolidate Sheets on the Ablebits Data tab. Select the worksheets for consolidation. Select the function to process your data with. Choose to consolidate by column or row label, or by position. Decide where to place the result. How many Excel worksheets can I combine at once? You are free to merge as many files as you need as long as the result table doesn't exceed Excel's limit for cells. These limits depend on the version of Excel you use. All my tables are formatted differently, how will your tools handle that? That depends on you, actually :) Our tools will keep the formatting of each original table if you choose to do so. Only the Consolidate Sheets Wizard won't be able to do that since it calculates numbers and creates a new summary report for you.